From Mythological sibling Apollo and Artemis the new DELOS, will be designed as a symmetrical aspect value due to the equilateral mythic triangle of the DELTA: symbol of Delos. The Cyclades and archeological Museum is also an allegory to the Mythology of Greece. The Cyclopes also name the Giants, created the Delos archipelagos of Mykonos by throwing giant stone on the Island. This granite stone and rocks are the true symbols of energy. The geological composition of Delos is composed of those three energy minerals: the quartz, the mica, and the feldspar. The equilateral triangle will be lined up with a North South axe, which will protect the entrance museum from the Melthem North East strong and cold wind. 5000 Sqm of livable space with a maximum length of 100 meters that will be divided in three volumes. The higher will have a height of 20 meters on which 3 to 5 meters will be under the ground level. 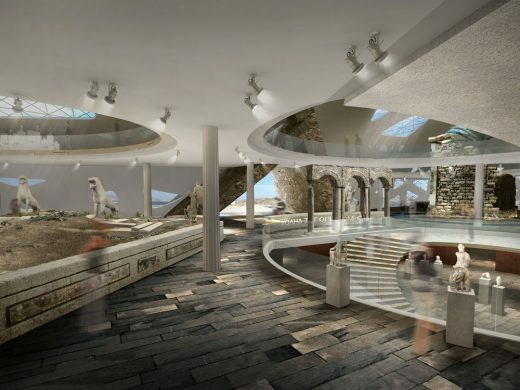 The ground level is very important because it is the reflexion of the existing ground of ancient Delos buried with time and destruction, as only 10 percent of the site has been yet discover. – One main Museum entrance. – One Delivery entrance for antiques discovery of archeologists, with a local restaurant and a cafe, stores, and museum archeological staff archeologist, guard, and local staff members. 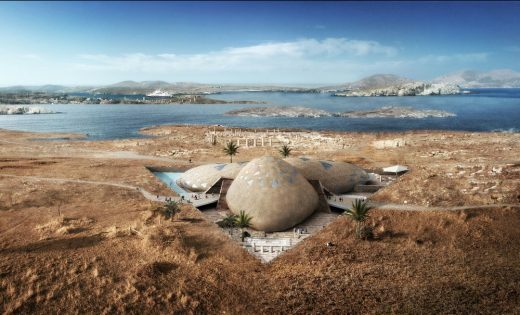 The main concept is to access and exit the Museum of Delos with three long concrete slabs bridges over a reservoir that will collect mostly rainy water during the winter and drainage in the ground. 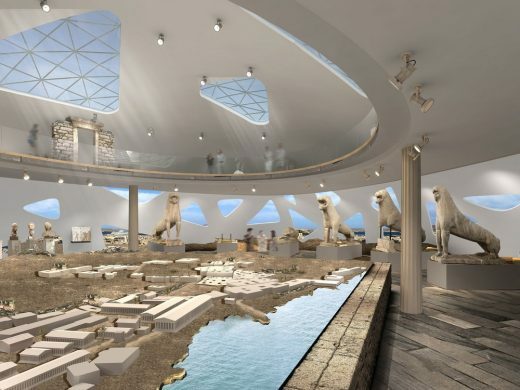 The construction of the Museum will be built with a reinforce concrete vault as the location of the Museum is in a very high density seismic location as we are in the epic enter of the Cycladic Island. 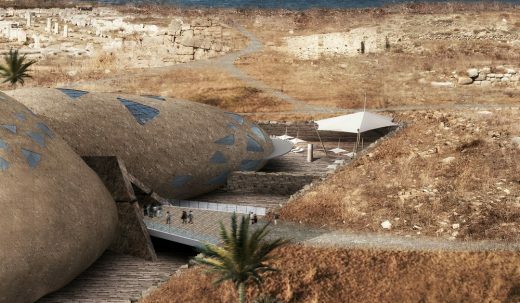 Museum discovery will have to be strongly protected. 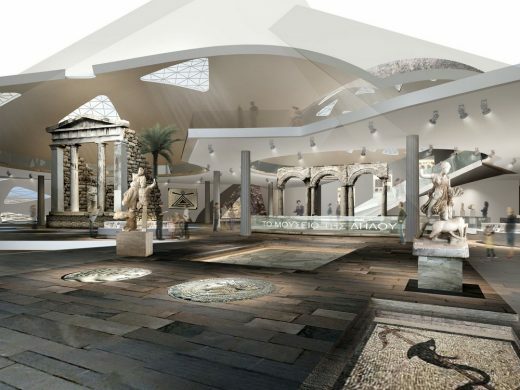 The concrete vault ceiling will also protected the content of the Museum from heat and will be high enough to have a sense of a natural astrological vault so important in the Ancient Greece. Mathematicians, astrologers, historians, philosophers will all agreed that the high volume is the important criteria of the Museum ceiling and vault. Based on an organically symbolic aspect of constructivism the epicenter of the Delos Museum will the spiral stair coming from the lower floor to the upper floor. Gradually the steps will enlarge and the second floor will be accessible with a large ramp, to make it easier for tourist walking to the second floor. Show case shops and window displays will distract the tourist. 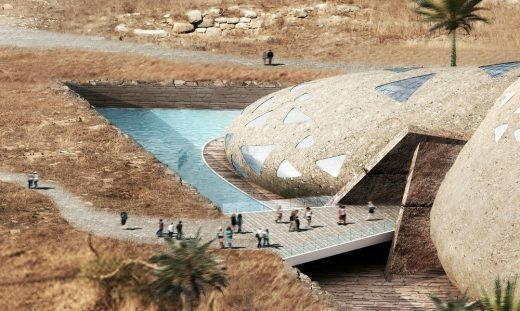 The concrete vault will be covered with stone and local vegetal will eat up the structure and blend in the environment. Large glass triangular opening will be located on the higher part of the vault to capture the light. Light in Delos is supposed to be the strongest light of the World with Easter Island in the South Pacific. Smaller size opening will be at eye level In order to be visible at any time from the inside of the Museum, looking at the site archeological contest. The floor stone is in rough marble, and any existing foot print of local archeological remains will be kept at original location to preserve site harmony and archeological historical respect. In order to be an active contemporary museum all displays of monument recovered or replace in context will have the possibility of being digitalized and re-constructed in 3 D image and projected on a screen in order to reflect the reality of the past. Light effect through out the Museum will be allowed through a light show. -A boutique , craftsman jewelery, bookstore store will be located on the north west side opening on a large patio overlooking the museum. A ” mise en scene ” will act a representation of a reconstruction temple with architectural elements. A mezzanine -amphitheater with 250 seats will be located in the east side. The height of the theater will be 17 m high. An interactive theater cine-panorama with projection on screen and the total vault to re-created a global site environment. Performance, and historical film of Delos will be presented to group and audience. The Lion gallery facing the way it should be the inside of the museum will be located in front of the huge 3D model and to guard the Museum. A bridge will cross the tank reservoir to the Museum. The triangular Delta door will welcome all the Tourist in front a very contemporary registration desk in glass with show cases of antique discoveries . 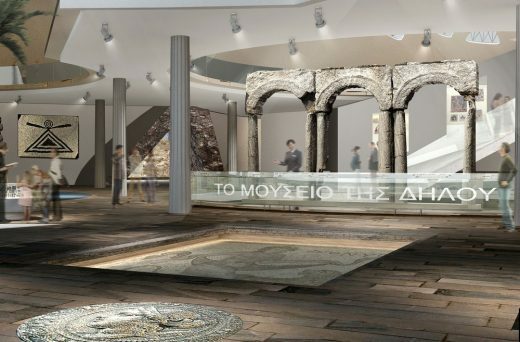 The main entrance with to footprint of old coins of the owners of the new sanctuary Apollo and Artemis, will be posted as medallion on the entrance pavement.